According to the Blu-ray Disc Association, the figures (via Impress Watch) from the week ending November 12 for sales of next-generation machines capable of recording show just 2.8 percent of them were HD DVD units. The remaining 97.2 percent were, of course, Blu-ray devices. 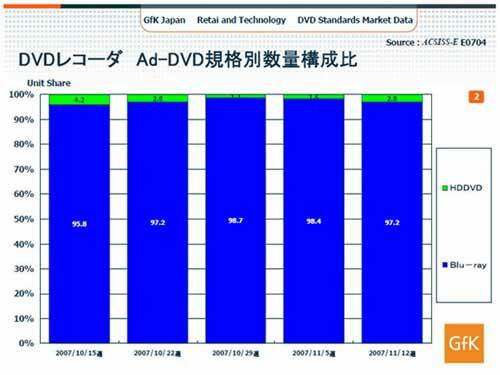 Naturally, the availability of Blu-ray machines plays its part - there are more models available in Japan - but the HD DVD Promotion Group will obviously be worried. Both formats still have some work to do in the home-recording market as a whole. Considering the older DVD format as well, the two newcomers account for just 19.8 percent of total recorder sales, with plain-vanilla DVD accounting for over 80 percent. Although less than a quarter of purchases are of next-gen recorders, the corresponding figure was a mere 5 per cent as recently as mid-October, so it can’t be long before DVD has to take a back seat, but will HD DVD be joining it?